The mammary glands are seen as a blessing to many ladies like actress Ronke Oshodi Oke, slay queen - Roman goddess and other figures but it seems like a curse to this person. 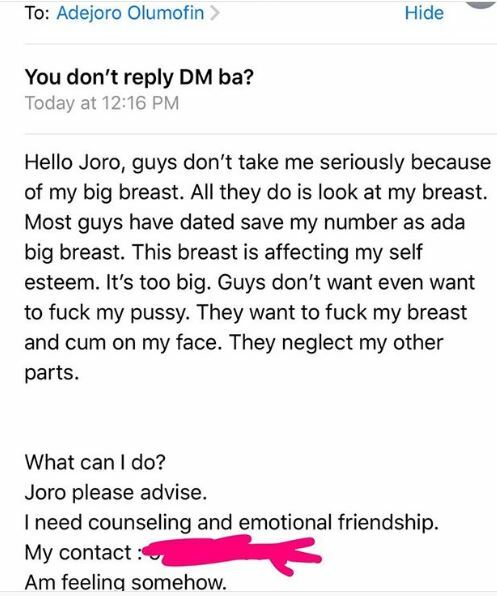 Relationship adviser, Joro Olumofin has shared the story of a young lady who is being frustrated by her large bosom. According to her, most suitors don't take her seriously as they just want to catch fun and later dump her.